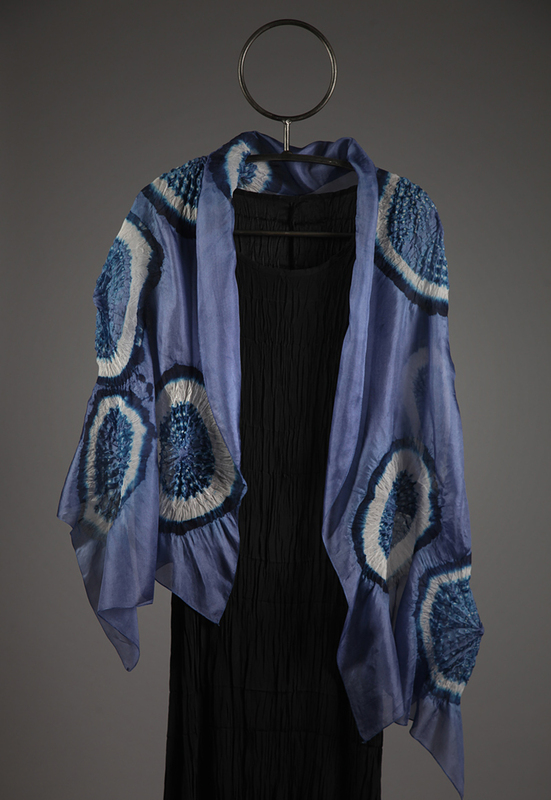 I began working with dyes and textiles during the tie-dye era of the late sixties. At first I used dyes from the grocery store, the same ones used by my mother to change the color of the curtains or bedspread to get a fresh new look. Soon I learned about the professional dyes used by batik artists. A life changing moment came when I saw the musical “Hair”. The stage sets, designed and made by artist Marian Clayden, were the size of a room and featured complex colors and designs. At that moment, I began to grasp the potential of what one could do with dyes and cloth. But how did she get such intricate colors and patterns? I found some of the answers in” Jack Lenor Larson’s “The Dyers Art, Ikat, Batik, Plangi”. This book introduced me to worldwide textile and dye traditions. Thus my journey began. Always curious about the natural world, I pursued a science education that led to a professional career in environmental chemistry. 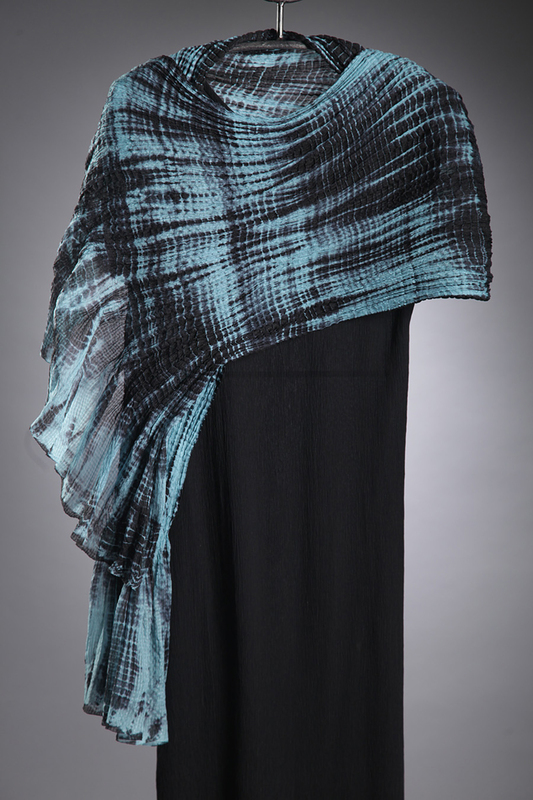 This fit well with my interest in dyes and gave me a deeper understanding of dye processes. 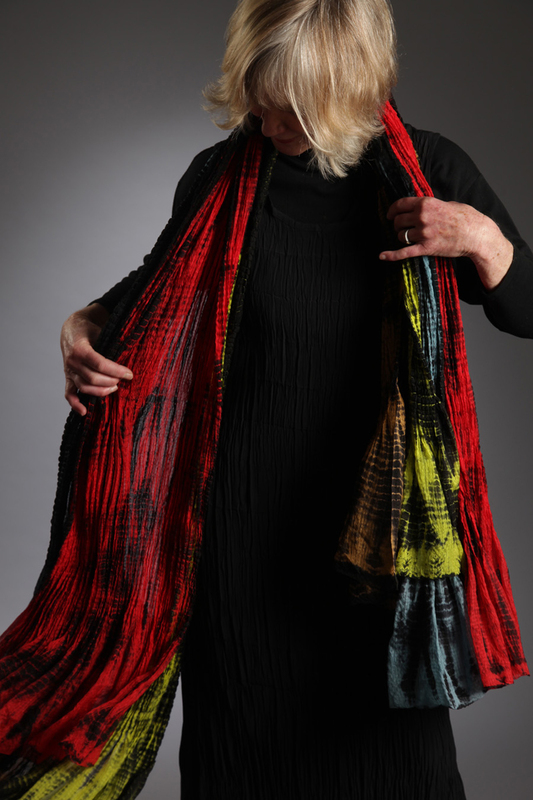 Over the years I have been privileged to study with many artists, among them world-renowned dyers and textile designers including Ana Lisa Hedstrom, Joan Morris, Elin Noble, Polly Stirling, Yoshiko, Wada, and Michele Wipplinger. I draw from a lifetime of color memories for inspiration. From early childhood, I was immersed in the fields of flowers at my family’s Dutch bulb farm. It must have been there in the tulip and gladiola fields where I first learned to distinguish and recall color nuances. Today, I spend many hours tending to the garden my husband and I have built as a labor of love. I continue to refine my color acuity and memory by auditioning color compositions in the borders and cutting gardens. The garden follows me into the studio where my fascination with the creative process remains as strong as when the journey began decades ago.